Lucky to have accidentally run across Tiny Miner on the Android Store, this Android game provided hours of casual brainless gaming. The gameplay itself is very simple. Dig for gems and minerals and return to the Saloon before you run out of energy. Buy miner tools such as ladders, supports, walkways, and medic packs before you head back out to the mines. The goal of the game is to mine in search of the super large white diamond. At that point, you've beat the game, but can continue to mine. Why Tiny Miner is Stress-Free? Straightforward game that doesn't require a long tutorial to learn all the various rules and features. Gameplay that doesn't require thinking multiple steps ahead. 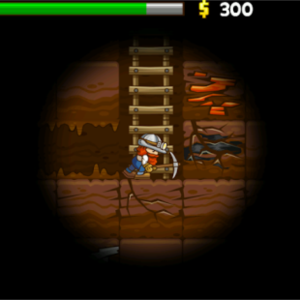 You can carry as many miner tools from the Saloon as necessary. Even though it's completely unrealistic, I always carry 100+ of each item, just in case. You can save your progress at any time, so there's no need to worry about reaching a save point. The graphics are basic with just enough animation to give the game life. Eventually, you'll beat the game, and can move onto something else. You won't feel like you've invested a lot of time in it. Always purchase tons of miner goods so that you never run out. Watch out for your energy meter at all times. The only thing the game doesn't warn you about is when you're about to run out of energy.